As someone who is a positive person by nature I often find it challenging to deal with negativity and negative people. This is particularly difficult when I face it in the workplace because it is an environment that I need to be in daily. So when I am in a negative situation at work I tend to step back and assess what is happening, who is giving off the negative vibes and what their point of view is. I tend not to react right away to negative attitudes, I’ve found that taking a breathe and reminding myself of my own frame of mind lessens the impact of another person’s negative attitude. Early in my career I worked with an individual who was constantly a “negative nelly.” She would complain on a regular basis about how much she hated work, her role and her responsibilities. While initially I didn’t react I found that over time her constant complaining crept into my own frame at work. The old adage ‘you are who you hang out with’ comes to mind. Not saying anything, combined with constantly being around this negative attitude was affecting me and my view of my workplace. Once I realized this I made a decision to speak frankly with this colleague. I encouraged her to get proactive about why she was feeling how she was feeling. She was surprised that her attitude was influencing me and dragging me down too. She apologized and we talked through some options. She ended up speaking to her manager, enlisted the help of human resources to connect with a career counsellor and identified areas in her work that were making her unhappy. After a few months of seeking support and talking more frankly to her manager, she slowly but steadily became a much more satisfied and happy colleague. The lessons I’ve gained from this experience are lessons that I’ve brought forward with me in my career. I’ve learned that if you stand by and just listen to negative attitudes eventually they will start to affect you. We need to be proactive in fostering our own healthy attitude at work. It takes effort, time and it’s an ongoing process, but it is well worth the reward. Negativity happens. It’s a reality, but it is up to us to manage its impact on ourselves and in our workplace. This entry was posted in Uncategorized on October 30, 2013 by Michelle Yao. Most of us have been there, finding the perfect job for you, while still working in your current job. We face the dilemma of what to do. Now there are good and bad ways to leave your job, but the preferred way is always to leave on good, or at least neutral terms. It’s always important that a former employer doesn’t have a bad impression of you. You never know who they know or who they might have a connection to. So in the spirit of leaving a job the right way, I thought I’d share some tips with you. News travels fast, especially interesting, new news. It’s always professional courtesy to let your supervisor know what is happening first. Letting your boss know in person is the most respectful, mature way to approach this matter. Two weeks is the general timeline. This gives you time to close off files and hand off projects. Sometimes you may not have time to do this, but leaving your replacement with a binder/guide enables them to understand your roles and responsibilities and shows your former employer that you are trying to proactively ease the transition. While this is not an exhaustive list, it provides a frame when approaching this situation. Remember respect is key, as is courtesy. You want to approach leaving a job with the idea in mind that you should act as you would like others to act in this situation. When in doubt it is also very helpful to consult with a former Manager/Supervisor, or even a career coach, and to discuss any other suggestions/thoughts with them. It is also important to keep in mind that what works for some, may not work for you. So compile your own list of tips and tricks – decide what you are comfortable with when making your decision public. This entry was posted in Is there a right way to quit your job? and tagged Resignation on October 11, 2013 by Michelle Yao. Career Coach: Friend or Foe? A Career Coach? Not until recently did I even know that such a person existed. Sports Coach, yes. Life Coach, sure. But Career Coach? Hmm, what an interesting idea. And why wouldn’t it be. Most of us recognize the benefits of having a coach. As children in sports leagues/clubs we came to rely on them as trusted advisors, strategists and often times our own personal cheerleaders. So why not have someone who can talk with you and strategize about what is the best career for you and how you can get the job you want. My experience with a career coach was nothing but positive. My coach met with me once a week for an hour, we explored my strengths, challenges and discussed what my career goals were. It was great to have someone to bounce ideas off of and discuss my opportunities and challenges with. She was emotionally supportive of the trials and tribulations that come with job searching and served as a fantastic sounding board. Especially during my more trying times I found having a career coach in my corner made the difference. It is not surprising then that I would say quite openly that for me having a career coach is invaluable when you are in transition and assessing what your next steps are. We have trainers for the gym, tutors for school, why not have a professional who can help equip us with tools and skills to get the job we want. A Career Coach helps you with things like resume preparation, editing cover letters, networking, developing your LinkedIn profile and preparing you for interviews. They are a valuable asset when approaching the question of what do I want to do and what will I enjoy doing. If you’ve never thought to connect with one, I highly recommend it. Who knows, you might be surprised with what you discover about yourself and what you want your career to look like. This entry was posted in Professional Development and tagged Career Coach, Coaching on May 3, 2013 by Michelle Yao. How Equitable are Diversity Strategies? Having a diverse workplace is important. It brings together a variety of perspectives and experiences. It creates an environment that can by dynamic, inclusive and vibrant. However, some could argue that the best way to see diversity reflected in an organization is to let it happen organically, that is the best people for the job are hired and then diversity results. I believe that diversity strategies do have a place in the workplace however they must prioritize experience and suitability at the forefront in order to be fair. Fairness and equality are just as important in any hiring strategy. In order to have an effective and successful workplace diversity strategies must be equitable. Diversity strategies should be a part of a broader HR strategy, and not only the main component. Only by making diversity strategies a piece and not the whole part of the hiring process will an organization ensure they are hiring the most suitable and skilled individuals. Therefore I believe that it is very important that diversity strategies be developed with equity in mind in order to ensure success for all employees. This entry was posted in How Equitable Are Diversity Strategies? and tagged Diversity, HR Strategy on February 22, 2013 by Michelle Yao. Cold Calls: Why Are They So Scary? So I’ve often found that when talking about cold calling with friends, colleagues and even people I’ve met for the first time, I see similar reactions. People cringe. They tense up. They mostly agree that it is not pleasant idea. So why do people do it? Because it is often an untapped form of networking. You can make connections with people you probably would not cross paths with in your regular day and find out about a professional field you are interested in firsthand. But why is it so scary? Simply put it is hard for people to put themselves out there, get out of their comfort zone and try something different. 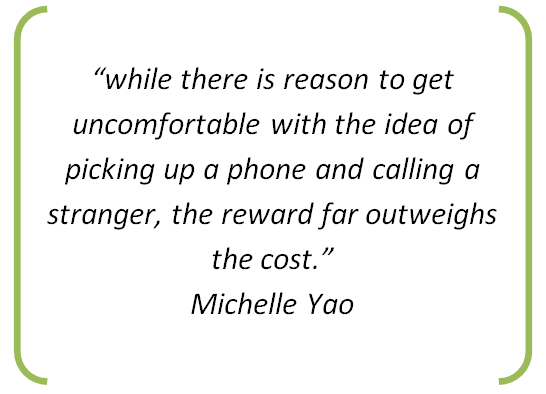 I would argue that, while there is reason to get uncomfortable with the idea of picking up a phone and calling a stranger, the reward far outweighs the cost. We need to realize that the benefit of reaching out and creating another professional contact is worth the discomfort. I remember being really interested in international relations as an undergraduate, but I wanted to know more. So after consulting a former colleague of mine in government I looked up some names at the Department of Foreign Affairs, did a little research and called some individuals who were working in areas I was interested in. It was refreshing to talk to real life people and not just rely on books or the internet. I do need to say that some people did decline to speak to me or meet for a coffee but there were a handful that were very amenable to talking with me and sharing their career paths and experiences. I deeply valued the opportunity to hear from people about the challenges and triumphs in their field. It gave me a really clear picture of what a job in that sector could look like. And it helped me assess if I wanted to pursue a job in that field. Overall, I strongly believe that cold calling someone is an important opportunity to find out more about a particular field and job. I would encourage those of you reading to take a chance, pick up the phone, because you never know who you might reach on the other end. This entry was posted in Networking and tagged Cold Calling, Networking on February 13, 2013 by Michelle Yao. So most of us are guilty of this, myself included, we don’t keep our resumes up to date. We put it off for another day and another time. We say we will do it when we can and then simply add it to our growing list of things to do. But then it happens. We see a posting for our dream job, but the deadline is tomorrow. And then we are left scrambling to piece together an articulate accomplishments-based resume that will get us the interview, and hopefully the job. As many of us know from experience getting the interview is no easy feat and a last-minute resume that is pieced together in haste rarely does the trick. Although it can be time consuming and arduous, keeping your resume up to date helps you keep a running inventory of your accomplishments and skills and also prepares you for networking opportunities. It also cuts down the time you spend scrambling to put a resume together for a job that crosses your path. It also cuts down the anxiety of resume writing when you have no choice because having a base to work from is always better than starting from scratch. So with the New Year upon us, I challenge readers to dust off their resumes and get updating in 2013! Happy writing. This entry was posted in Resume Building and tagged job search, resume on January 15, 2013 by Michelle Yao. Whose Responsibility is it to Ensure that Employees are Engaged? Both employers and employees have an equally important role in ensuring that people are engaged in their work. Employers need to make sure the conditions in the workplace encourage innovation, initiative and growth, because these are key elements in helping employees feel engaged with the work they are doing. Employers also need to set performance management goals with their employees in order to balance expectations and tangible results. This helps to ensure that both employer and employee are on the same page. Employers also need to check in with their employees on a regular basis to discuss growth opportunities and workplace challenges. Staying engaged with employees helps make sure that employees are feeling engaged with their work. Employees on the other hand need to actively pursue professional development opportunities. Many workplaces not only offer, but encourage employees to work on new projects, take on different roles, and pursue career advancement. I strongly believe that employees need to identify key elements that they are passionate about or interested in to stay engaged with their work. Employees must also be proactive, if they are feeling detached or discouraged in their work they need to talk with their managers/supervisors, and work to identify challenges as well as opportunities to change this situation. Employees need to challenge themselves on a regular basis so they don’t become complacent or bored with the work that they are doing. Employees have a big role in shaping the level of engagement they have with their work. While there is no magic one-size fits all solution to staying engaged with work, I believe that if both employers and employees work together they can ensure that work stays challenging as well as rewarding. This will be of benefit not only to the employer and employee but to workplace productivity and workplace culture. This entry was posted in Employee Engagement, Whose Responsbility is it to Ensure that Employees are Engaged? and tagged employee engagement, employee engagement surveys, employer responsibility, human resources, workplace culture on December 17, 2012 by Michelle Yao.